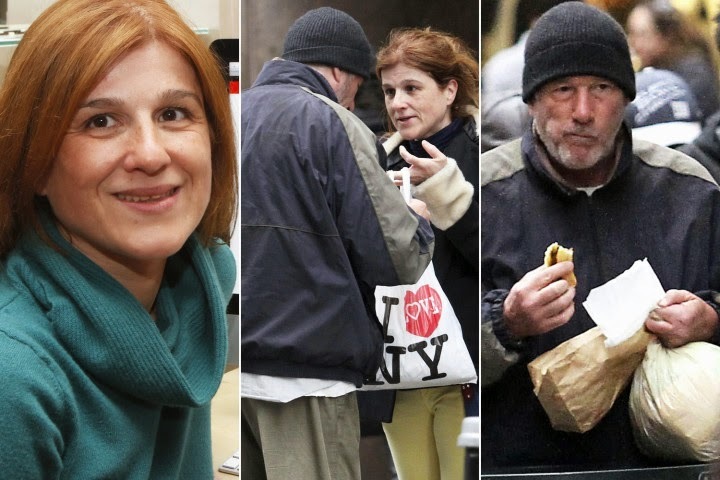 Dailybuzz.ch: Tourist Gives Homeless Man Pizza In NYC — Without Realizing It's Richard Gere! Tourist Gives Homeless Man Pizza In NYC — Without Realizing It's Richard Gere! When a kind-hearted tourist offered a homeless man her leftovers last week, she never expected to see her face plastered on the Internet a few days later. Turns out, the man Karine Gombeau approached near Grand Central Station was none other than Golden Globe-winning actor Richard Gere! The 62-year-old, who was in character for his new film Time Out of Mind, was rummaging through a garbage can and drinking beer from a brown paper bag when Paris-resident Karine saw him. "I said ‘Je suis désolée [I am sorry], but the pizza is cold,'" the good Samaritan remembered of her encounter with Richard. “He said ‘Thank you so much. God bless you.'" She only realized it was the celebrity after spotting her picture online. Karine felt it was only right to give the remnants of her "enormous" pizza from a Little Italy restaurant to a man searching for food. "It leaves me really sad to know we waste food and they have nothing," she told the NY Post. "It really moves me." Time Out of Mind, which co-stars Kyra Sedgwick and Jena Malone, follows a homeless New Yorker (Gere) trying to reconnect with his estranged daughter. And though he may look destitute during filming, Richard is reportedly worth a whopping $100 million.